What Is Necrotizing Fasciitis (Flesh-Eating Disease)? What Is the History of Necrotizing Fasciitis? What Are Causes and Risk Factors of Necrotizing Fasciitis? What Are Signs and Symptoms of Necrotizing Fasciitis? When Should Someone Seek Medical Care for Necrotizing Fasciitis? What Specialists Treat Necrotizing Fasciitis? What Tests and Exams Do Physicians Use to Diagnose Necrotizing Fasciitis? Are There Home Remedies for Necrotizing Fasciitis? What Are Treatments for Necrotizing Fasciitis? When Is Follow-up Necessary After Treatment of Necrotizing Fasciitis? How Can People Prevent Necrotizing Fasciitis? What Is the Prognosis of Necrotizing Fasciitis? Necrotizing fasciitis (NF) is a rapidly progressive infection that primarily affects the subcutaneous connective tissue planes (fascia), where it may quickly spread to involve adjacent soft tissue, leading to widespread necrosis (tissue death). Several different types of flesh-eating bacteria may cause this life-threatening condition, which can affect both healthy individuals as well as those with underlying medical problems. Though rarely encountered, there has been an increase in the incidence of necrotizing fasciitis over the last few decades. Though likely under-reported, the annual incidence of necrotizing fasciitis has been estimated to be about 500-1,000 cases per year, with a global prevalence of 0.40 cases per 100,000 population. Early identification and prompt treatment of necrotizing fasciitis are critical to managing the potentially devastating consequences of this medical emergency. One of the first descriptions of necrotizing fasciitis came from Hippocrates in the fifth century BC, when he described complications of erysipelas. Though necrotizing fasciitis has existed for many centuries, several more detailed descriptions of this condition were subsequently reported in the 19th and early 20th century. In 1952, Dr. B. Wilson first used the term necrotizing fasciitis to describe this condition, and this term has remained the most commonly used in modern medicine. Other terms that have been used to describe this same condition include flesh-eating bacteria syndrome, suppurative fasciitis, necrotizing cellulitis, necrotizing soft tissue infection, hospital gangrene, streptococcal gangrene, dermal gangrene, Meleney's ulcer, and Meleney's gangrene. When necrotizing fasciitis affects the genital area, it is often referred to as Fournier gangrene (also termed Fournier's gangrene). Necrotizing fasciitis is caused by bacteria in the vast majority of cases, though fungi can also rarely lead to this condition as well. Most cases of necrotizing fasciitis are caused by group A beta-hemolytic streptococci (Streptococcus pyogenes), though many different bacteria may be involved, either in isolation or along with other bacterial pathogens. Group A streptococcus is the same bacteria responsible for "strep throat," impetigo (skin infection), and rheumatic fever. In recent years, there has been a surge in cases of necrotizing fasciitis caused by community-acquired methicillin-resistant Staphylococcus aureus (MRSA), often occurring in intravenous drug abusers. Most cases of necrotizing fasciitis are polymicrobial and involve both aerobic and anaerobic bacteria. Additional bacterial organisms that may be isolated in cases of necrotizing fasciitis include Escherichia coli, Klebsiella, Pseudomonas, Proteus, Vibrio, Bacteroides, Peptostreptococcus, Clostridium, and Aeromonas hydrophila, among others. In many cases of necrotizing fasciitis, there is a history of prior trauma, such as a cut, scrape, insect bite, burn, or needle puncture wound. These lesions may initially appear trivial or minor. Surgical incision sites and various surgical procedures may also serve as a source of infection. In many cases, however, there is no obvious source of infection or portal of entry to explain the cause (idiopathic). After the bacterial pathogen gains entry, the infection can spread from the subcutaneous tissues to involve deeper fascial planes. 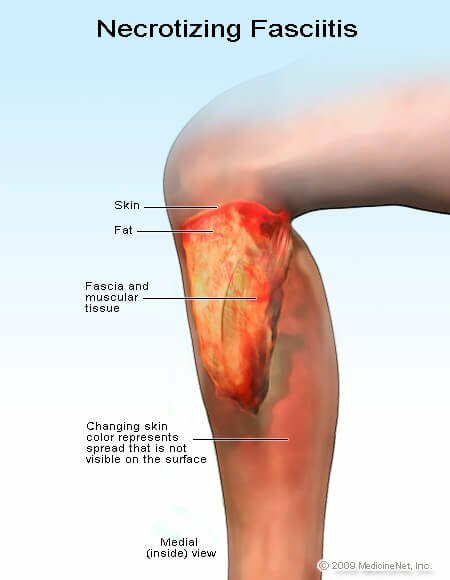 Progressive rapid spread of the infection will ensue, and it can sometimes involve adjacent soft tissues as well, including muscle, fat, and skin. Various bacterial enzymes and toxins lead to vascular occlusion, resulting in tissue hypoxia (decreased oxygen) and ultimately tissue necrosis (death). In many cases, these tissue conditions allow anaerobic bacteria to proliferate as well, allowing for the progressive spread of infection and continued destruction of tissue. Individuals with underlying medical problems and a weakened immune system are also at increased risk of developing necrotizing fasciitis. Various medical conditions, including diabetes, renal failure, liver disease, cancer, peripheral vascular disease, and HIV infection, are often present in patients who develop necrotizing fasciitis, as are individuals undergoing chemotherapy, patients who have undergone organ transplant, and those taking corticosteroids for various reasons. Alcoholics and intravenous-drug abusers are also at increased risk. Many cases of necrotizing fasciitis, however, also occur in otherwise healthy individuals with no predisposing factors. For classification purposes, necrotizing fasciitis has been subdivided into three distinct groupings, primarily based on the microbiology of the underlying infection; type 1 NF is caused by multiple bacterial species (polymicrobial), type 2 NF is caused by a single bacterial species (monomicrobial), which is typically Streptococcus pyogenes; type 3 NF (gas gangrene) is caused by Clostridium spp., and type 4 NF is caused by fungal infections, mainly Candida spp. and Zygomycetes. Infection caused by Vibrio spp. (frequently Vibrio vulnificus) is a variant form often occurring in individuals with liver disease, typically after ingesting seafood or exposing skin wounds to seawater contaminated by this organism. Necrotizing fasciitis is not considered to be a contagious disease. However, it is theoretically possible for an individual to become infected with the same organism causing necrotizing fasciitis in someone with whom they have had direct close contact (for example, a MRSA infection). For that exposed individual to then go on to develop necrotizing fasciitis would be very rare and unlikely, though it is possible. The symptoms and signs of necrotizing fasciitis vary with the extent and progression of the disease. Necrotizing fasciitis often affects the extremities or the genital area (Fournier's gangrene), though any area of the body may be involved. Early in the course of the disease, patients with necrotizing fasciitis may initially appear deceptively well, and they may not demonstrate any superficial visible signs of an underlying infection. Some individuals may initially complain of pain or soreness, similar to that of a "pulled muscle." However as the infection rapidly spreads, the symptoms and signs of severe illness become apparent. Necrotizing fasciitis generally appears as an area of localized redness, warmth, swelling, and pain, often resembling a superficial skin infection (cellulitis). Many times, the pain and tenderness experienced by patients is out of proportion to the visible findings on the skin. Fever and chills may be present. Over the course of hours to days, the redness of the skin rapidly spreads and the skin may become dusky, purplish, or dark in color. Overlying blisters, necrotic eschars (black scabs), hardening of the skin (induration), skin breakdown, and wound drainage may develop. Sometimes a fine crackling sensation may be felt under the skin (crepitus), signifying gas within the tissues. The severe pain and tenderness experienced may later diminish because of subsequent nerve damage, leading to localized anesthesia of the affected area. If left untreated, continued spread of the infection and widespread bodily involvement invariably occurs, frequently leading to sepsis (spread of the infection to the bloodstream) and often death. Other associated symptoms seen with necrotizing fasciitis may include malaise, nausea, vomiting, weakness, dizziness, and confusion. If a person has been previously evaluated by a healthcare professional and there is a progression of the above symptoms, or if the person fails to improve (even with antibiotic treatment at home), prompt reevaluation must occur. If necrotizing fasciitis is even suspected, an expedited surgical consult is needed. A multidisciplinary team of providers is needed in the care of patients with necrotizing fasciitis. The majority of patients will initially go to an emergency department, and therefore will see an emergency-department physician. A surgeon will become involved early on in the care of these patients. Depending on which area of the body is involved, surgical subspecialists may also need to be consulted (for example, a urologist in cases of Fournier's gangrene). An infectious disease specialist is frequently involved to help direct antibiotic treatment. The diagnosis of necrotizing fasciitis is often presumptively made initially based on the patient's history and physical examination findings. Though there are several laboratory tests and imaging studies that may assist in making the diagnosis of necrotizing fasciitis, immediate results may not be readily available. Therefore, a high index of suspicion in any patient with symptoms or signs suggestive of necrotizing fasciitis should prompt immediate consultation with a surgeon in order to expedite management. Laboratory testing includes various blood tests such as a complete blood count (CBC), which may reveal an elevated white blood cell count (WBC). Electrolyte panels, blood cultures, and other blood tests are also generally obtained. However, the results of these blood tests cannot be solely relied upon to make an immediate diagnosis. Imaging studies such a CT scanning, MRI, and ultrasound have all been used successfully to identify cases of necrotizing fasciitis. They may be used when signs are equivocal or the diagnosis is in doubt. These modalities may help identify areas of fluid collections, inflammation and gas within the soft tissue, in addition to helping delineate the extent of the infection. Although occasionally plain radiographs (X-rays) may demonstrate gas in the soft tissue, they are considered less useful and of little value. Obtaining imaging studies should not delay definitive treatment in those cases highly suggestive of necrotizing fasciitis. Tissue culture, tissue biopsy, and Gram stain results can help definitively identify the organism(s) responsible for the infection, and this can help guide appropriate antibiotic therapy. Necrotizing fasciitis is an emergency condition that cannot be managed at home. Patients with necrotizing fasciitis require hospital admission, appropriate IV antibiotics, surgical debridement, and close observation in an intensive-care unit. When the diagnosis of necrotizing fasciitis is highly suspected or confirmed, immediate measures must be taken to initiate treatment and quickly intervene in order to reduce morbidity and mortality. The medical treatment of necrotizing fasciitis primarily involves the administration of antibiotics, with hyperbaric oxygen therapy and intravenous immunoglobulin (IVIG) administration used much less commonly. Definitive treatment for necrotizing fasciitis, however, ultimately requires surgical intervention. Initial management includes patient stabilization, including supplemental oxygen, cardiac monitoring, and intravenous fluid administration. Some patients with sepsis may require the administration of intravenous medications to increase blood pressure and/or the insertion of a breathing tube (intubation) in cases of severe illness or respiratory compromise. Close monitoring and supportive care in an intensive-care unit is required. Broad-spectrum antibiotics should be started immediately. As the responsible organism(s) may not be known initially, antibiotics should include coverage for a wide array of organisms, including aerobic gram-positive and gram-negative bacteria, as well as anaerobes. Consideration for infection caused by MRSA must also be taken into account. There are various antibiotic regimens available, which may involve monotherapy or multidrug regimens. Commonly recommended antibiotics include penicillin, ampicillin-sulbactam (Unasyn), clindamycin (Cleocin HCl, Cleocin Pediatric), aminoglycosides, metronidazole (Flagyl, Flagyl 375, Flagyl ER), cephalosporins, carbapenems, vancomycin (Lyphocin, Vancocin HCl, Vancocin HCl pulvules), and linezolid (Zyvox). Most clinicians treat with more than one IV antibiotic because bacteria causing necrotizing fasciitis are often resistant to more than one antibiotic and some infections are caused by more than one type of bacteria. Antibiotic coverage can be adjusted once culture results identify the causative organism(s) and antibiotic sensitivity results are available. Antibiotic sensitivity testing is required to adequately treat MRSA and the new NDM-1 antibiotic resistant strains of bacteria. This therapy delivers highly concentrated oxygen to patients in a specialized chamber, thereby increasing tissue oxygenation. This inhibits anaerobic bacteria and promotes tissue healing. Some investigators feel that HBO reduces mortality in certain patients when used in conjunction with an aggressive treatment regimen that includes surgery and antibiotics. HBO is not widely available, therefore, consultation with a hyperbaric specialist may be necessary. However, this should not delay definitive surgical management. Some investigators feel that IVIG may be a useful adjunct treatment in certain cases of streptococcal necrotizing fasciitis, as it has been shown to successfully neutralize streptococcal exotoxins in Streptococcal toxic shock syndrome (STSS). However, its use is controversial in necrotizing fasciitis and therefore it is not considered to be the standard of care. Rapid surgical debridement of infected tissue is the cornerstone of treatment in cases of necrotizing fasciitis. Early detection and prompt surgical intervention has been shown to decrease morbidity and mortality, underscoring the importance of early surgical involvement and consultation. Extensive surgical debridement of all necrotic tissue is required. Wide and deep incisions may be necessary to excise all infected tissue (fascia, muscle, skin, etc) until healthy, viable tissue is visualized. Repeated surgical debridement is often necessary within the ensuing hours to days after the initial surgical intervention, as progression of the disease may be sudden, severe, and unrelenting. Sepsis may lead to other infection sites and those areas may need surgical intervention, resulting in some patients requiring multiple amputations. In some cases, despite repeated surgical debridement, a life-saving amputation may be necessary if the necrosis is too widespread and the imminent risk of overwhelming sepsis and death is felt to be present. Patients who survive necrotizing fasciitis often require follow-up with various specialists, depending on the complications encountered during their hospital course and the subsequent outcome. Many patients require skin grafting and/or reconstructive surgery, as well as physical therapy and rehabilitation. Psychological intervention is sometimes needed for certain patients who may experience depression, anxiety, or other psychological repercussions. Preventive measures can be taken to decrease the chances of developing necrotizing fasciitis, though it may not be entirely preventable in all cases, as often the underlying cause is not identified. Because many cases of necrotizing fasciitis begin after some type of skin trauma, proper wound care and management are important. Keep all wounds clean and watch closely for any signs of infection. Early detection and treatment of infection may be the best measure to prevent the subsequent development of necrotizing fasciitis. Promptly seek medical care if any signs or symptoms of infection appear. Patients with underlying medical problems, such as diabetes, should watch closely for any signs of infection, and those individuals with a weakened immune system should take measures to avoid exposure to potential infections. Avoiding seafood and direct contact with warm seawater potentially contaminated with Vibrio species is recommended for those individuals with liver disease. Individuals with active skin infections or open wounds should consider avoiding whirlpools, swimming pools, and natural bodies of water. Maintaining good personal hygiene and frequent hand washing can prevent infection and help control the spread of infection. Following guidelines of proper sterile surgical technique and practicing strict barrier (gloves, gowns, masks, etc.) and isolation precautions in hospitals can also allow healthcare personnel to prevent the development and spread of infection. The prognosis for patients with necrotizing fasciitis depends on many factors, including patient age, underlying medical problems, the causative organism(s), extent and location of infection, as well as the time course of diagnosis and initiation of treatment. Early diagnosis and aggressive surgical and medical treatment are the most important factors in determining the outcome. Necrotizing fasciitis is a life- and limb-threatening condition that carries a poor prognosis if left untreated or undertreated. Complications and potential results may include limb loss, scarring, disfigurement, and disability, with many patients going on to develop sepsis, multisystem organ failure, and death. Combined morbidity and mortality rates have been reported to be between 70%-80%. Mortality rates in the scientific literature range anywhere between 8.7%-76%. The mortality rate for untreated necrotizing fasciitis approaches nearly 100%. Streptococcus pyogenes, also known as group A beta-hemolytic Streptococcus, or group A strep (GAS) is a gram-positive coccus (spherical bacteria) that is ubiquitous, highly communicable, and spread primarily through person-to-person (skin-to-skin) contact and via respiratory droplets, as the human skin and mucous membranes are the only known reservoir for GAS. GAS is associated with toxic shock syndrome and with life-threatening skin and soft-tissue infections, most notably necrotizing fasciitis, each of which is associated with an incredibly high morbidity and mortality. Misiakos, E.P., G. Bagias, P. Patapis, et al. "Current Concepts in the Management of Necrotizing Fasciitis." Front Surgery 1 (2014): 36. United States. Centers for Disease Control and Prevention. "Necrotizing Fasciitis: A Rare Disease, Especially for the Healthy." June 15, 2016. <http://www.cdc.gov/features/necrotizingfasciitis/>. Please describe the treatment(s) you received for necrotizing fasciitis. What symptoms and signs did you have? Please share your experience with necrotizing fasciitis.